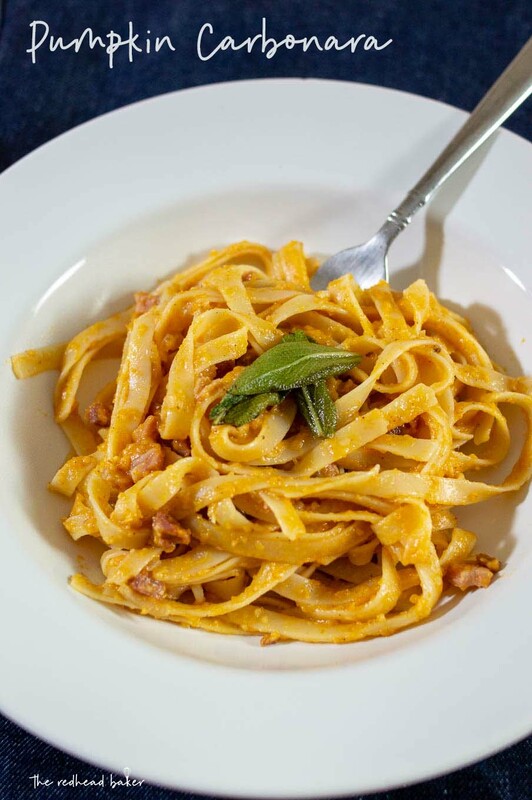 Carbonara is a sauce made from bacon, eggs and cream. 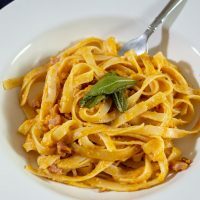 In this pumpkin carbonara, the creaminess comes from pumpkin, making this a delicious fall meal. 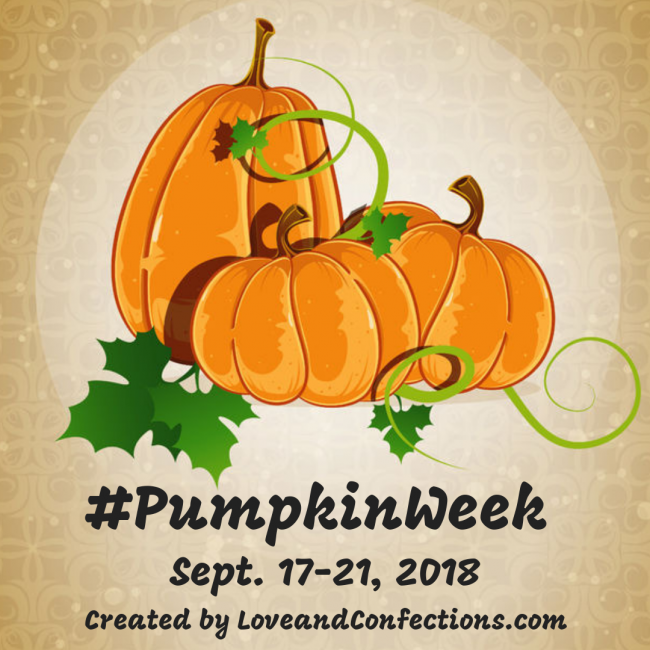 Welcome to #PumpkinWeek 2018 hosted by Love and Confections and A Kitchen Hoor’s Adventures! This year is even bigger and better than ever with a giveaway! Thirty nine bloggers from around the United States are showcasing their best pumpkin dishes. Get ready for Fall with over 130 pumpkin recipes throughout the week including cocktails, main courses, pizzas, pastas, pastries, breads, muffins, and plenty of desserts! 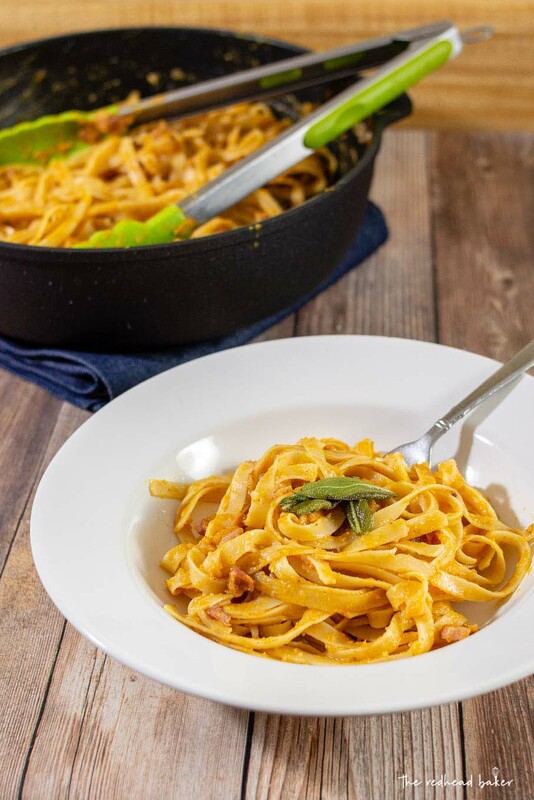 I’m kicking off fall with a savory pumpkin twist on carbonara. Carbonara is a sauce typically made from egg yolks, cream and bacon. In this recipe, however, instead of cream, we’re using pumpkin. Spaghetti is typically used in carbonara, but as you can see, I used fettuccine. Linguini or bucatini would be fine as well. 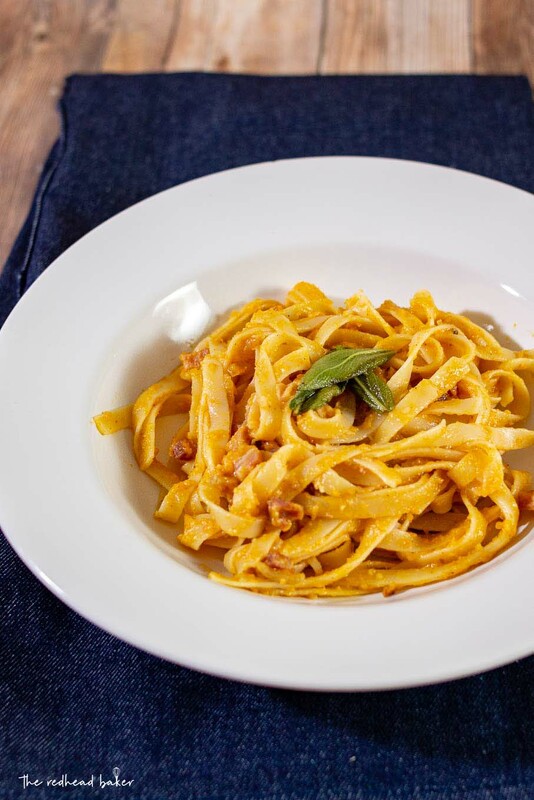 Make sure to reserve a little of the pasta cooking water to use in the carbonara sauce. Drizzle it in slowly while you whisk, not all at once, or else you end up with scrambled egg yolks. Also, instead of bacon, I used pancetta. Partially because I like the flavor better, and partially because I can get a 4-ounce package of it pre-chopped! I’m all for taking any shortcuts I can get. Finally, the fried sage. Yes, it’s an extra step, and another dish to wash. But I would urge you not t0 skip it. I love the flavor that both the sage and the browned butter give to the dish. Just remember to keep a close eye on the butter. I don’t turn up the heat under the butter until the carbonara is done cooking, because butter can go from pleasantly nutty to acridly burnt in the blink of an eye. Set a large pot of salted on water over high heat to boil. Cook the pasta according to package directions for al dente. Drain, reserving 1/2 cup of the pasta cooking water. While the pasta is cooking, saute the pancetta over medium heat, until browned and crisp. Remove with a slotted spoon to a paper-towel-lined plate. Add the shallots and garlic to the pancetta drippings and cook for about 3 minutes, stirring frequently. Add the chicken broth and cook until the broth is reduced by half. Add the butter to a small saucepan set over low heat to melt. Add the pancetta back to the saute pan along with the drained pasta. Toss to combine. Turn off the heat. In a medium mixing bowl, whisk together the pumpkin and egg yolks. 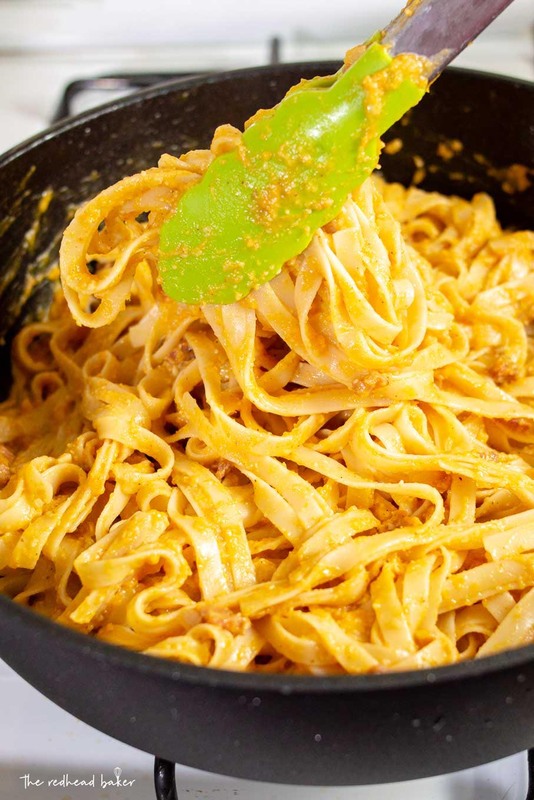 While whisking, slowly drizzle in the half-cup of hot pasta cooking water. Stir in the cheese and pepper, and add the mixture to the saute pan, stirring until the sauce is smooth and slightly thickened. Taste and adjust seasonings as needed. Turn up the heat under the butter to medium and cook the butter just until it starts to brown. Once it does, remove the saucepan from the heat and add the sage leaves one at a time, ensuring they don't overlap. Fry for about 2 minutes, then remove with a fork or slotted spoon. Divide the pasta between four serving bowls. Top each with 2 fried sage leaves and a few shavings of pecorino romano cheese. Here’s more delicious PumpkinWeek recipes! I am a sucker for any pumpkin dessert! Mainly pumpkin cheesecake but you put it in front of me and I will try it! I love anything pumpkin! Fall is the time for pumpkin whoppie pies, pumpkin bread, pumpkin muffins and doughnuts. Yum-yum. I would never skip the fried sage- love that part! How interesting to use pumpkin instead of the cream too! I like pumpkin bread the best! Pumpkin rolls–I love the cream cheese filling!